The Hawaiian Grouper (Epinephelus quernus) is a species of concern belonging in the species group "fishes" and found in the following area(s): Hawaii, United States Minor Outlying Islands. Copyright Notice: This article is licensed under the GNU Free Documentation License. It uses material from the Wikipedia article "Hawaiian grouper". Glenn, C. R. 2006. "Earth's Endangered Creatures - Hawaiian Grouper Facts" (Online) - Licensed article from Wikipedia: The Free Encyclopedia. Accessed 4/18/2019 at http://earthsendangered.com/profile.asp?sp=11389&ID=7. Need more Hawaiian Grouper facts? 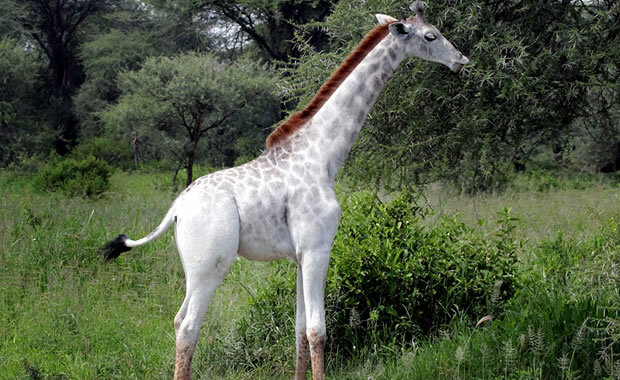 A pair of white giraffes have been discovered in Kenya recently by local residents. According to the residents, the beautiful white giraffes were very close to them, extremely calm, and did not seem disturbed by their presence. The residents immediately tipped off conservationists who then found the giraffes in the Ishaqbini Hirola Conservancy, an already established safe space dedicated to the preservation of antelopes in the area.